A beautiful edition - specially commissioned with the artist Richard Collingridge, this copy has been signed by both author and artist to the title page. 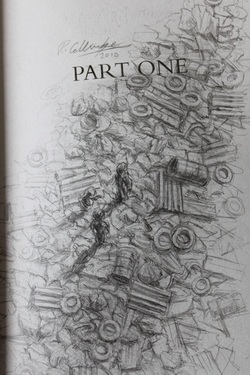 The artist has also hand-sketched a unique, one-off drawing in each copy - please see images. If you want a particular copy, please ask before purchasing, to make sure it is still available. Synopsis : Raphael is a dumpsite boy. He spends his days wading through mountains of steaming trash, sifting it, sorting it, breathing it, sleeping next to it. Then one unlucky-lucky day, Raphael's world turns upside down. A small leather bag falls into his hands. It's a bag of clues. It's a bag of hope. It's a bag that will change everything. Soon Raphael and his friends Gardo and Rat are running for their lives. Wanted by the police, it takes all their quick-thinking, fast-talking to stay ahead. As the net tightens, they uncover a dead man's mission to put right a terrible wrong. It's three street-boys against the world. NOTE : I have a couple of these, and the image of the sketched copy shown may not be the one you receive - if you wish confirmation of the copy you will receive, please contact me before purchasing. UPDATE - this book has just been optioned for a movie by Working Title films - this is sure to drive up the value of these unique copies.